The Following is not my review of my own book, The Smile Ambassadors, but an independent review from onlinebookclub.org, which can be viewed here: http://tinyurl.com/TheSmileAmbassadors. Official Review: The Smile Ambassadors by Jeffrey ReidPost Number:#1 by wendyj » 06 May 2014, 15:47[Following is the official OnlineBookClub.org review of "The Smile Ambassadors" by Jeffrey Reid. ]I received a free copy of The Smile Ambassadors by Jeffrey Reid in exchange for my honest review. This is a fictional story that is loosely based on the life of a real, live, two-headed turtle. It is intended for children ages 8-14 but is also a suitable read for adults.Zack and Mack are unique. Lovingly referred to as “the boys” by their owners, they are a red-eared slider turtle with two heads. Zack and Mack are seven years old, the same age as their owner Constance. Zack and Mack joined the family when Constance was an infant and they have grown up together. At birth, Zack and Mack were about the size of a quarter and at the age of seven, are about the size of a saucer. One day while cleaning their cage, Constance’s mom accidently knocks over the box she has temporarily put the boys in. An adventure begins as Zack and Mack sneak across the floor, out the door, across the street and into the creek. Once they realize they have lost Zack and Mack, Constance and her parents frantically search the house and neighborhood for their precious two-headed turtle. The family decides to contact the local newspaper and television station. Who could anticipate the chain of events the search for a little girl’s turtle could set off?Suddenly, the entire town is looking for Zack and Mack. A major, international media event begins to swirl as people across the town, the state, the country and even internationally follow the search for Zack and Mack. The story of the lost turtle tugs at everyone’s hearts and spurs their imaginations. There is something enchanting about the turtle with two heads that seems to be smiling. Looking at the picture of Zack and Mack, people just feel like smiling. Even the President of the United States is interested in the story; he wants Zack and Mack found so that he can make them “smile ambassadors.”Meanwhile, the boys are enjoying their adventure, swimming in the creek, eating worms and basking in the sun. They even have a few close encounters with predators; something they have never encountered in their protected family environment. Eventually the boys find their way to the local fair where they are found by a sideshow owner and entered into a turtle race. The boys don’t know it, but this will be the first of many races for them.Constance and her family are reunited with Zack and Mack when they just happen to attend the local fair and decide to watch the turtle race. Before they know what has happened, the family is off to meet the President and Zack and Mack are named “Smile Ambassadors” for the United States. The President wants Zack and Mack to travel around the world bringing smiles to everyone who experiences the wonder of the turtle with two heads. Just maybe a smile for a two-headed turtle will be a smile for the United States.Thus the odyssey begins for Zack and Mack, Constance, and her family as they spend a year on a globe-trotting tour. Along the way, Constance makes many new friends and so do the boys. Ultimately, the boys return to their hometown for an international turtle race. Who will win: Zack and Mack or one of the international competitors? Are friendships stronger than the thrill of winning? Can turtles strategize and communicate? Is there some special power this two-headed turtle has? You’ll have to read the book to find out.Overall, I enjoyed this book. It was a bit slow-paced in places but I suppose that is appropriate for the age group targeted. The narrative is at times told from Constance’s perspective and sometimes from the turtle’s perspective. This gives a charming insight into what a turtle may be thinking. While the story line is a bit farfetched – the government paying for a world tour for a turtle and it’s family – it is a fun and surreal family adventure that would appeal to young readers. It is refreshing to read a book where nothing bad really happens, everything is wrapped up in a happy ending, and there is a nice moral-to-the-story thrown in. Therefore, I give it a 4 out of 4 stars.According to the author, the story of Zack and Mack will continue in a second book tentatively titled: The Smile Thief. 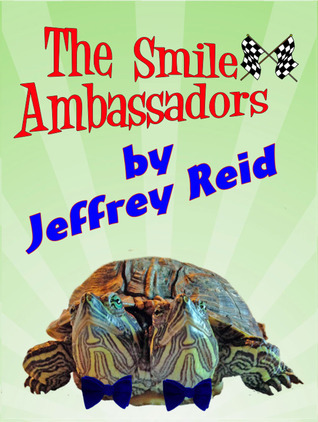 Jeffrey Reid - We are Zack and Mack and we are a real, live two-headed turtle with a new book about our adventures titled The Smile Ambassadors. We live in the idyllic Gold Country of Northern California. When we are not busy with our adventures, we like to eat and bask in the warm sun. Of course there is always training for our next turtle race. Training, training, training, that's all we seem to do these days. Can't we have a break so we can smell the daffodils growing along the fence-line?